Whether you’re a student, graphic designer, gamer or writer, buying a new monitor for your desktop computer can be a tricky decision – especially as our monitors tend to have multiple uses. That’s why we’ve put together a comprehensive guide to choosing the right monitor. It’s full of useful information to help make buying a new monitor easy. How do you plan to use your monitor? For tasks like sending emails, checking social media, surfing the web and paying bills online, you won’t need a high-performance monitor with lots of extra features. There are many inexpensive monitors on the market that will suit your needs. Don’t feel that you need to settle for a small screen, either – even Full HD regular size monitors (23” – 24”) are more affordable than you might think. Monitors for multipurpose use provide the display quality and performance you need for everyday activities like streaming videos and movies, sharing photos and slideshows, creating spreadsheets and video conferencing. An LED or IPS monitor with Full HD resolution is ideal. Opting for a touchscreen or a larger monitor (27” or bigger) could double as your home entertainment centre. Photographers, graphic designers, video production artists and multimedia professionals need a monitor specifically designed for content creation. This means a larger screen with Full HD resolution (at a minimum) to ensure more screen space and the better display of images. You can't go wrong with an IPS panel, with its accurate colours, crystal-clear display and wide viewing angles. If you regularly edit video files, look for a monitor with a response time of 5ms or less to reduce motion blur and ghosting. This is when a faint trail is left on the screen from previous images. Also consider if you’ll need an adjustable stand or dual-display mount to make viewing easier and more ergonomic. Gamers need a monitor that can keep up with the speed and intensity of today’s games. We recommend a monitor with Full HD resolution, a response time of 5ms or faster. If you enjoy dual boxing, add a second monitor to your gaming setup to simultaneously view each character's screen. Monitor screen size is measured diagonally, just like TVs. As screen size increases, prices usually do too — so consider how much space you have, as well as how much you want to spend. Smaller monitors are reasonably priced and deliver quality performance for a range of everyday applications, like using MS Office and browsing the internet. Monitors in the mid-size screen range are perfect for multipurpose home and office use, whether you’re watching movies and TV shoes, playing games or viewing and creating documents. Larger monitors offer a bigger viewing area for serious gamers and professionals in photography, graphic arts and video production. Monitors commonly range between 18.5” and 32” – measured diagonally across the screen. Always measure the width and height of the space where your monitor will sit before making a purchase. If you tend to work on multiple documents on your desktop, two smaller monitors might be better than one large screen. Bigger isn’t always better when it comes to the resolution of a monitor. It’s all about choosing the right resolution for your needs – whether that’s typing a document, browsing the web, photo editing or gaming. HD and HD+ resolutions, available on 15”-20” monitors, provide quality displays at affordable prices. Also known as QHD, Wide Quad HD or WQHD, this technology gives you four times as many pixels as 720p HD. It delivers extraordinary image clarity, ideal for demanding applications such as CAD, graphic design and professional photo and video editing. Sometimes called 4K or UHD, 4K Ultra HD is the highest resolution currently available. With four times as many pixels as Full HD, it delivers the ultimate technology for gaming, multi-tasking, high-resolution photo and video editing, and many other purposes. 4K Ultra HD is perfect for gamers, graphics pros and movie fans who demand the very best from their multimedia. Movie fans and gamers should check to see what 4K content is available before they choose this resolution. The different types of technology used in computer monitors make them ideal for different uses. Most modern LCD monitors use LED (light-emitting diode) technology. LED monitors provide excellent overall picture quality. They produce brighter images and require less power than traditional CCFL (Cold Cathode Fluorescent Lighting) LCD monitors. They usually have slimmer and lighter designs too. IPS (in-plane switching) monitors deliver deeper blacks and more accurate colour than most LED or LCD monitors. This makes them ideal for photo editing, graphics work and gaming. These monitors also offer wider viewing angles, so the picture looks exceptional even if you're not sitting directly in front of it. VA’s offer large viewing angles and good colour reproduction, though not as good as IPS panels. They offer better colour reproduction and wider viewing angles than TN panels, but have slower response times. TN is the most common panel type. The main advantages of TN panels is the response time which is usually quicker than most other panel types. Their viewing angles, brightness, and colour reproduction is not as good as the IPS and VA panels. The closer a monitor can get to displaying a true black, the more accurate its colour is. A good way to check the display quality of a monitor is by testing at what angle the colours and brightness begin to look different. The wider the viewable angle, the better the monitor. There are some extra features to look out for to help you get the most out of your new computer monitor. If you plan to mount your monitor to a desk or wall, look for one that is VESA compliant. This means the monitor has an industry standard mounting (hole) pattern on the back. Not all monitors have built-in speakers, so be sure to add this feature to your checklist if you plan to use your monitor for Skype calls, watching videos or listening to music. Speakers can also be purchased separately if you prefer. 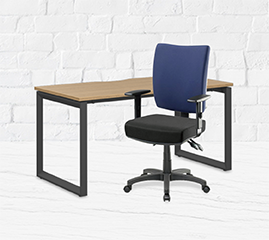 Monitors with stands and adjustable functionality — like tilt and swivel, height and pivot adjustment — mean you'll be able to move the monitor into a comfortable position. Some monitors can be rotated into the portrait position and are great if you work on spreadsheets. Monitors that have a built-in webcam are ideal if you have limited space above or around your monitor. They’re great for video chats with family and friends or video conferences with colleagues. Most computer monitors have HDMI, which carries both video and audio signals. HDMI is excellent for playing HD content from your computer, gaming console, Blu-ray player and other devices. DisplayPort is the best choice for very high resolutions and frame rates. It carries both video and audio signals like HDMI, but while HDMI can only carry 4K Ultra HD at 30 fps (frames per second), DisplayPort can handle this resolution at 60 fps, giving you a much smoother picture for fast-paced games and movies. A monitor with a USB hub allows you to connect peripherals to the hub to improve your productivity. Simply connect your Notebook to the display with a single USB cable, and you are ready to use the attached peripherals like an external HDD or a camera. How Energy Efficient Is Your Monitor? An energy efficient monitor uses less electricity, helping you to save money. Look for the energy rating label when selecting your monitor - the more stars, the more energy efficient it is. Use the Australian Government's Energy Rating Calculator to find out approximately how much your monitor will cost to run. The following monitor accessories can help to ensure a better viewing experience. Surge protectors prolong the life of your computing equipment by preventing power surges and spikes, which can cause serious damage over time. Dual Monitor Stands let you dock two monitors on one stand, allowing you to multitask, play games or view spreadsheets side-by-side. Monitor risers are designed to raise your computer monitor to a comfortable viewing height and improve your posture.